Immediately to the north of the junction of Dixons Hill Close and Dixons Hill Road in Welham Green, North Mymms, is the site of a medieval moated homestead which archeologists have dated back to the 13th century. The moat (grid reference TL 22738 05143), which is now partly infilled and built on, was examined almost 70 years ago when pottery and coins dating back to 1279 were found. The North Mymms History Project has been researching the moat’s history following a query raised by a reader of the site. The full HER record is available to view here on Historic England’s Heritage Gateway. In the summer of 1950, John Philip Cozens Kent a Hertfordshire numismatist was given permission to carry out an excavation at the moat. His record of the excavation and what he found was published in two journals that we know of. 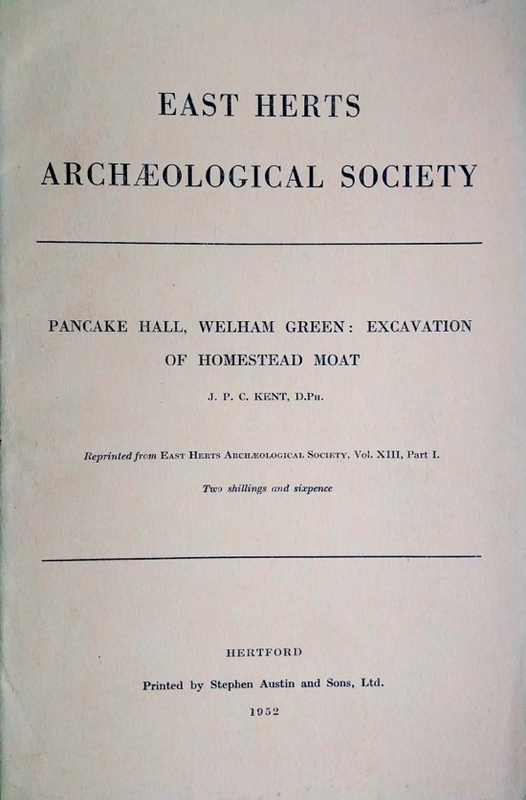 There was an abridged version in the Barnet and District Record Society’s half-yearly bulletin published in July 1951, and a more comprehensive account in the East Herts Archaeological Society’s booklet entitled ‘Pancake Hall, Welham Green: Excavation of Homestead Moat’, published in 1952. 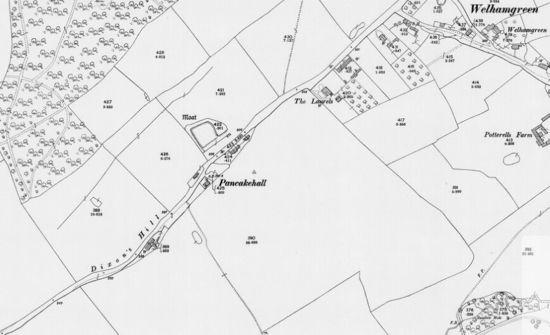 According to the author, the original name of the site has not been found, although it’s thought it could be the unidentified Aberdenecroft or Bushcroft, names that appears in early deeds in North Mymms parish. The following are transcripts of both versions of the excavation of the moat. 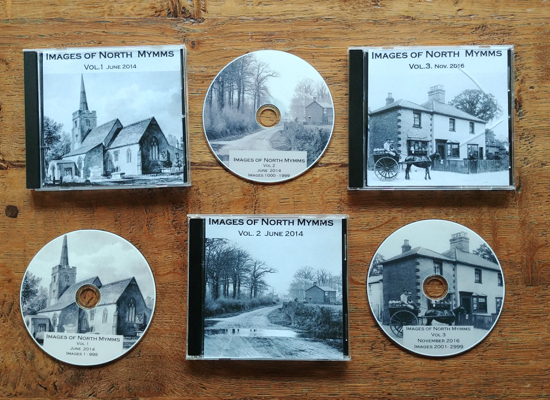 The first is the abridged version, donated to the Images of North Mymms Collection by Phil Elgar with the original document embedded below. The second is a longer and more detailed account from the Peter Miller Collection, published with the permission of the East Herts Archaeological Society. In the summer of 1950, the Barnet and District Record Society extended its activities by undertaking the excavation of the site of a mediaeval moated farmhouse. Although important work has been done elsewhere by local historical societies, mediaeval Hertfordshire has hitherto remained in an archaeological backwater. Despite the large number (over 200) of moated farmsteads of this period, only two have been examined. One of these, at *Nuthampstead, had never been completed or inhabited. The description of the other, particularly as regards finds, was totally inadequate. The need for the excavation of a typical Hertfordshire site therefore remained, and when it was learned that an example at Welham Green was being disturbed by cultivation, it was decided that work should begin there. Sites of this character are purely domestic, and in no sense military. The moat, though pretentious in width, is often of negligible depth, and it was frequently dug only round the side of the dwelling facing the entrance. Since it was not defensive, it was probably a mark of wealth and social distinction. The moat is generally nearly square in shape, though a few, for example those at Astwick Manor, near Hatfield, and Broad Colney, are irregular. 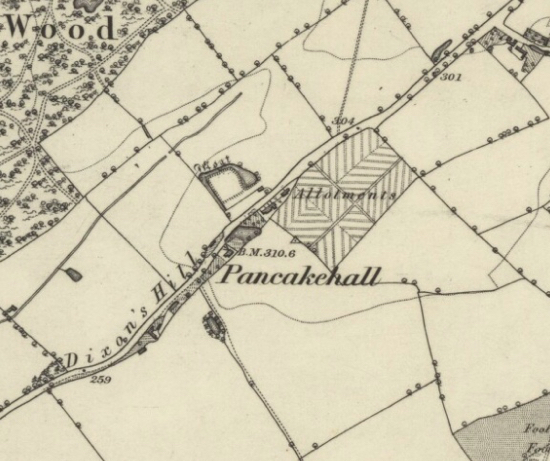 The moat at Welham Green is situated in Fifty Acre field, beside Dixon’s Hill Road, in an area known locally as Pancake Hall. It is an irregular quadrilateral, whose sides vary in length between 95ft. and 135ft., surrounded by a moat about 20ft. wide on three sides, widened to 60ft. on the N.E. side. This peculiarity which I have noted nowhere else was proved to be an original feature when the upcast mound from it was found to be about twice the size of the others and uniform in consistency. The water, which still fills three sides of the moat, seems originally to have come from a now largely filled-in pond across the road. Beside this is a shallow well, and there was, no doubt, formerly a spring here. The overflow runs from the W. angle, the lowest point of the site, to a small stream flowing in the direction of North Mymms. Although recut in recent times, it evidently represents the line of an original feature, such as is usual on these sites. Bad weather and cultivation restricted the work, but it was possible to date the occupation closely and also give a picture of the main building in two stages of its existence. Trenches dug across the filled-in side of the moat proved that it had been very shallow. The slope of the ground is such that if the ditch had contained more than two feet of water, the back of the site would have been flooded. Although no evidence of dating was found here, the structural sequence was clear. Above an accumulation of 15 inches of silt lay, in one area, a mass of fragments of tile, and above this, another 8 inches of silt. This debris represents a reroofing of the main building with tile some time after its original construction, when it had presumably been thatched or shingled. This interpretation was confirmed by finds at the W. corner, where a mass of broken tiles overlaid, and was therefore later than a shallow pit containing a considerable quantity of pottery. The peg-holes of many of these tiles had not been properly pierced, and they therefore represent discarded or broken material, and not debris from the house after its destruction. Among them were a number of curved ridge-tiles. These were, of course, not pegged to the roof, but each had a square hole in the middle, intended to receive an ornamental cresting. The whole building may have been rebuilt at the same time, but cultivation prevented the examination of the foundations to determine this. No brick was found, and the only dressed stone discovered was a small block of limestone. It is therefore almost certain that the buildings were of timber, perhaps with stone dressings round the doors. It has not so far been possible to determine the point at which the moat was crossed; on the S.W. side about three-quarters of the way towards the S. angle, a patch of gravel about 10 feet wide and some 9 inches thick was encountered. This was perhaps the track, which would have been carried over the moat by a wooden bridge. Attempts to trace this in the field outside were frustrated by the weather. An equally probable site is at the E. angle on the S.E. side, where the remains of an iron-bound door and an iron latch-lifter of indeterminate date were recovered from the moat. 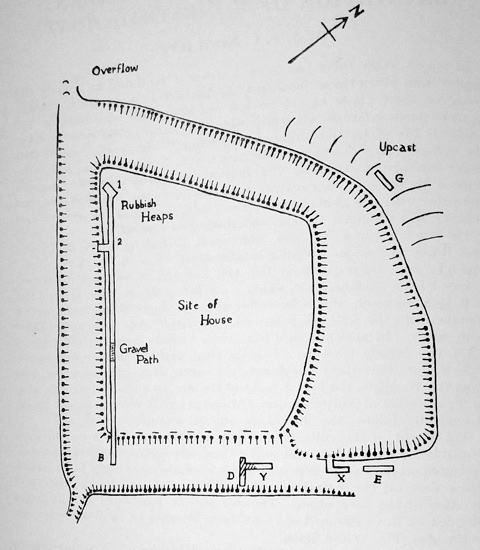 Sketch of the site by the author J. P. C. KENT. The finds fixed the date of occupation to the first half of the 14th century. The pottery was mostly found in two rubbish heaps, one near the W. angle, the other about one-third of the way down the S.W. side. It is remarkably homogeneous in character, and can scarcely represent the development of more than a few decades. There was a complete absence of the wall-sided pottery made of gritted clay, such as is characteristic of mediaeval sites of 13th century date, and the only vessel deriving from a form of that period, a cooking pot with a tripod base, was found trodden into undisturbed clay below the other finds. With a single exception, the rims of all the cooking pots were boldly out-turned and rounded, unlike the small, square rims found in London and the south-east. They no doubt represent the products of local kilns, perhaps at Potters Bar, where I have noted surface finds of similar pottery, including a glazed waster. A date between 1300 and 1350 for the occupation is confirmed by the close correspondence of the glazed wares to those found at Pachenesham, near Leatherhead, in levels dated by documentary evidence to after 1296. A coin said to have been found on the site, but since lost, was minutely described to me by the finder, and seems to have been a silver penny issued between 1279 and 1335. The large rubbish heap by the W. angle produced one other find of outstanding interest. This was a small pair of shears the ancient equivalent of scissors of London Museum type II, to which was found rusted the gilt blade of an iron knife. Further search produced fragments of the bone handle, and it was possible to clean and restore both articles. Together with the other finds, these have been generously presented by the owner of the site to the Barnet Museum. Documentary evidence of the name of the site has so far not been found, though it may be the unidentified **Aberdenecroft, mentioned in 1333 and 1338. The finding of articles of everyday domestic use and the examination of the sites where they are found gives a clearer picture of the way in which our ancestors lived than any other source. It is hoped that the society will follow up this work with similar excavations; every such excavation is not only a contribution to knowledge, but may corroborate inferences drawn from previous work. Thanks are due particularly to the owner, Mr. James Crawford, of Potterells Farm, North Mymms, for permission to excavate; and also to Mr. Green, the tenant, and his wife, for giving every possible facility and help; also to Messrs. D. F. Renn and G. R. Gillam, without whose active help the excavation could not have been carried to its successful conclusion. * Antiquaries Journal XXVI (1946) pp. 138-144. ** Place Names of Hertfordshire p. 66 (from Westminster Abbey Muniments). The original document from which this text is taken, is embedded below. It is from Phil Elgar and part of the Images of North Mymms Collection. This second transcript is from the East Herts Archaeological Society’s booklet entitled ‘Pancake Hall, Welham Green: Excavation of Homestead Moat’, published in 1952. It is from the Peter Miller Collection. By J. P. C. KENT, D.PH. In recent years there has been a welcome tendency to remedy the neglect from which the archaeology of medieval domestic sites has suffered. However, there exists as yet no body of knowledge regarding the 200 or more moated farmsteads which were the characteristic centres of the economic life of Hertfordshire, and therefore, when it was learned that the well-preserved example at Welham Green, North Mymms, had come under intensive cultivation, the Barnet and District Records Society decided to sponsor an excavation to recover such stratified material and other evidence as remained. The ready consent of the owner  and tenant  was obtained for the undertaking of limited work. The site  lies in Fifty Acre field, about 50 feet to the N. of Dixons Hill Road, and is an irregular quadrilateral whose S.W., N.W., N.E., and S.E. sides are respectively 136, 117, 110, and 96 feet long. It is surrounded by a shallow moat which is 30 feet wide on three sides. The N.E. side, however, widens to 80 feet at the E. angle, where an imperfect junction with the S.E. side is formed. The latter alone is no longer filled with water. In ancient times this seems to have been derived from a pond, now largely filled in, across the road, and the shallow well beside this suggests that there was formerly a spring here. The overflow runs from the W. angle, the lowest point of the site, to a small stream flowing in the direction of North Mymms. Although partly recut in recent times, it evidently follows the line of an original feature. The extent of the cultivation led to a severe limitation on the area available for excavation, and under these circumstances effort was concentrated on the two problems to which a solution was likely to be found. These were (a) the remarkable plan of the moat, and (b) the date and duration of the occupation. 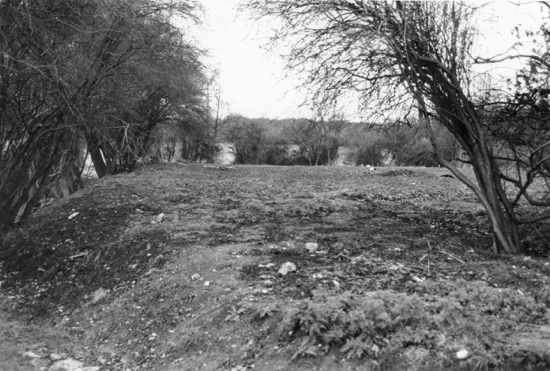 Trenches will be mentioned by the letter assigned to them during the excavation, in order to facilitate reference to the plan (Fig. 1) and finds. As was customary, upcast from the moat had been thrown up outside the inhabited area. At the N. angle, where the junction of the slight mound of the N.W. side and the much larger one from the wide N.E. side formed an apparent gully, a cutting (G) 10 feet long was made in an E.-W. direction at a distance of 12 feet from the water’s edge. A line level with the top of the N.E. mound was taken as datum, and the base of the ancient turf was found running horizontally at a depth of 51 inches. Below this was the undisturbed yellow clay. The turf averaged 14 inches in thickness, but a small sand-filled depression showed that the lowest 4 inches alone of this was undisturbed. The remainder is to be explained as piled up sods cut from the line of the moat. Above this was a uniform layer of speckled clay, dug from the ditch. Its very uniformity proved conclusively that the wide N.E. side formed an original feature of the layout. The upcast mounds on the N.E. and N.W. sides are respectively 47 and 29 inches high above the medieval turf-line. In the original plan there was a causeway at the E. angle. Trenches E and X showed that the moat had never extended further towards the road than at present. 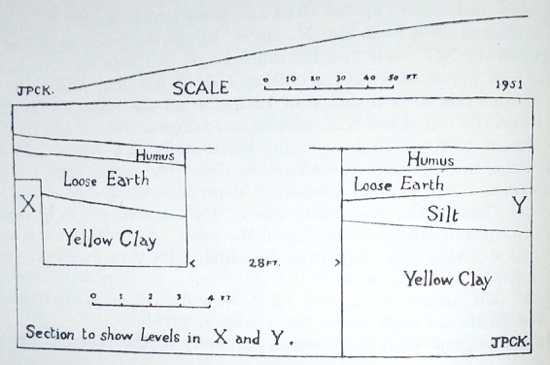 Furthermore, the silt levels in Y, cut in the original ditch, are in part at a higher level than the clean clay in X and this proves that the ground here had been cut away subsequent to the digging and flooding of the original moat. The necessity of allowing access to the site prevented linking X and Y, 28 feet apart, to find the original dimensions of the causeway. Since in recent times farmers have aimed to unite rather than separate the area from the field, we may assume that the destruction of the causeway took place while the site was still inhabited. Its purpose was no doubt to embellish the house with a complete moat crossed by a bridge. The absence of any silt layer in X shows that it was never completed, and the stoppage of work here can best be explained by the abandonment of the house. Some confirmation of the existence of the entrance at this point may be found in the discovery in E of an iron latch-lifter and a fragment of a horseshoe of medieval date. Sections 15 feet and 17 ft. 6 in. in length were cut in the S.E. arm of the moat at B and D. The ditch seems to have silted up and been drained by a general fall in the water level, and not to have been filled in. It was a very slight affair with a shelving bottom, but its steep cut banks no doubt conveyed the illusion of depth when it contained water. The silt level commenced at the S.E. end of D 8 inches below the modern surface. At the other end, 14 ft. 6 in. away, it began 16 inches below the turf and was 26 inches thick. The section obtained at B began 16 ft. 6 in. from the outer bank and cut back into the inner lip, shows that the silt layer was no more than 20 feet wide. Levels taken at a point 100 feet towards the W. angle prove that the maximum depth of water in the S.E. side as first dug was no more than 30 inches. Had it been more, parts of the site would have been flooded. Beginning 5 ft. 7 in. from the outer edge of D., embedded in the silt, was found a deposit of tile fragments 2 inches thick extending for the rest of the length of the trench. Trench Y, 3 feet from the inner end of D, was excavated for 15 feet towards the E. angle, and shows that the area of tile, shaded on the plan, extended for 7 feet in that direction. The interpretation of this deposit has not yet been settled. The finds at the rubbish heap at the W. angle showed that the house was tiled only in a second stage of its existence, and if these could be regarded as builders’ debris we should have welcome evidence that house and moat were contemporary. However, proximity to the demolished causeway leaves open the possibility that the tiles are remains from the gatehouse built on it. Only a very complete examination of the area could settle the issue. The layer of silt had thinned to 9 inches at the E. end of Y, and must have ended within the next 6 or 7 feet. Further excavation in this direction was not, however, possible. The silt contained animal bones, small oyster shells, and carbonized twigs and small branches, among which the Department of Botany of the Natural History Museum identified specimens of Birch, Hazel, Ash, and Willow. No stratified datable remains were found outside the inhabited area. Cultivation on the island confined operations to the excavation from the W. angle of a trench 136 feet long linking on to the end of B. A considerable quantity of pottery was recovered, as two deposits of rubbish were intersected. This was thrown in heaps on the ground and not buried in a pit as was customary, and the upper layers were therefore somewhat dispersed. Sufficient remained in situ, however, for a distinction to be drawn between earlier and later deposits, particularly at Heap 1. This centred round a shallow pit 7 feet from the end of the trench filled with yellow clay and thinly lined with charcoal at the bottom. Its diameter was between 4 and 5 feet, and it was 18 inches deep. Little pottery was recovered from the fill, but it included the rim and base of a cooking pot belonging to a vessel found embedded in the adjacent undisturbed clay (No. 8, Fig. 2, 7). The pit was therefore contemporary with the earliest phase of occupation, and was perhaps connected with work during the building of the house. The pottery will be discussed in detail in a later section of this report. The complete absence of gritted wares and the infrequency of thumb-pressed decoration suggests an initial date of c. 1300, while the close similarity of all the pottery indicates a relatively short period of occupation. In this same deposit was found a pair of shears of a type dating from the mid-thirteenth century and later with the iron blade and splintered bone handle of a typical table knife. Above, and separate from the pit, was a mass of broken tile fragments 4 feet in breadth and 9 inches thick. The peg-holes of several of the fragments were inadequately pierced, and others were distorted. Since none of these pieces can ever have been used on a roof, they were evidently discarded during building operations. Tiles were not found at a lower level in the heap, and it is therefore probable that the original buildings on the site were thatched or shingled and that tiling was carried out at a later date. No complete tile was recovered, and the longest fragment noted measured 8.1 inches. Eight complete widths varied between 6-5 and 7.0 inches, and averaged 6.67 inches. The peg-holes are often irregular, and are generally surrounded by a raised rim, a feature frequently edging the whole tile. Corners are often, though not invariably, rounded. Ridge tiles with an angular section are well represented. Centrally in the top of each is punched a square hole with rounded corners, designed probably to hold an ornamental cresting. The centre of the second and smaller heap was about 30 feet further along the trench. The area covered by pottery a little way over the lip of the moat, and since it is therefore later than this, its contents are probably on the whole later than those of Heap 1. At a distance of 32 feet from the W. end of the trench, a cut 4 feet wide and 9 ft. 6 in. in length was made into the S.W. bank to within 4 feet of the present water-level. This showed that the bank had never been reveted or palisaded. Fifty feet beyond the cutting was encountered a patch of gravel 9 inches thick and 10 feet wide, running slightly obliquely across the trench. This had all the appearance of a track, but since the main entrance was certainly at the E. angle, this can only have served a “back door”. Somewhat similar gravel was found in the field just across the moat, together with oyster shells and a few scraps of glazed pottery (No. 2). There was presumably a bridge at this point but no traces of it were found. In the absence of any immediate likelihood of further excavation at this site, a summary of our conclusions may be attempted. The original plan comprised the moat, in its present form, except for a narrow causeway at the E. angle, on which a gatehouse was built. Entry was thus made at the most impressive point, while the moat itself was dug so as to create an illusion of size and depth. Since the upcast from the moat was thrown outside the inhabited area, there is a possibility, for which there is at present no evidence, that it was dug around existing buildings. The first occupation of the site, by thatched or shingled buildings, seems not to antedate c. 1300. 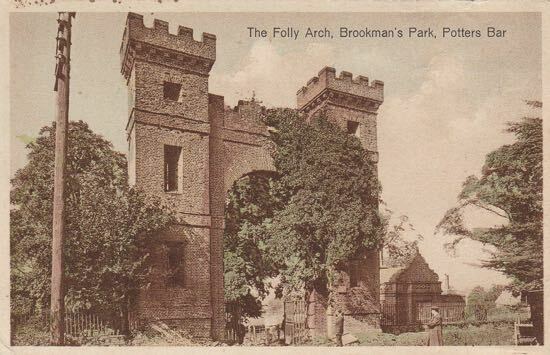 At a later date tiles were added, and the gatehouse seems to have been tiled when it was demolished along with the causeway on which it stood. Occupation seems to have ceased about the date of this demolition, probably within fifty years of the erection of the first buildings. Of a good number of surface finds made in the inhabited area only two medieval sherds were of a date later than those recovered by excavation, and they are therefore probably strays. Unless there exist sealed pits undisturbed by cultivation, I think it unlikely that further excavation will materially alter these findings. A date in the first half of the fourteenth century is confirmed by the only other reported find, a silver coin, now lost, but minutely described to me by the finder. There is little doubt that it was a “Long Cross” penny of the years 1279-1335. Documentary evidence relating to the site or its inhabitants is lacking, though the unlocated Aberdenecroft (1333 and 1338) and Bushcroft are possible identifications. Its short life was clearly one of steadily increasing prosperity, and the reason for its abrupt abandonment can only be conjectured. The need for more commodious premises is perhaps a more probable cause than a sudden collapse in the family fortunes, and the silting up of the shallow S.E. side may explain why the move was made, perhaps to a site not far distant. My thanks are due to A. W. G. Lowther, F.S.A., and Mrs. Audrey Williams, F.S.A., for much help and advice. E. M. Jope, F.S.A., kindly examined the unstratified pottery, and Mr. John Holmes made available to me his finds from Brent Pelham. Little Hertfordshire pottery has been published in the past, and there is consequently a lack of comparative material. Since a fairly close dating can be given to our site, full treatment has been accorded to the finds, so that they may serve as a guide to future excavators. This should be particularly useful in the case of the pottery, which is of purely local type, and no doubt emanated from South Hertfordshire kilns yet to be discovered. Mr. Crawford, of Potterells Farm, the owner of the site, has generously presented the finds to the Barnet Museum, where they will be available for students. Glazed wares are scarce on this site, and in two instances only was enough of any one pot recovered for restoration to be attempted. Jug fabrics are pink or red, and are very hard and well fired. The vessels are less local in character, as is to be expected. (1) Large jug, salmon-coloured ware, sagging base, with a slashed handle of strap section. From Heap 2. About 16 inches high, diameter at base 8.75 inches. Much of it is covered by a thin greenish-yellow glaze applied over a white slip. The thumb impressions around the base have centres one inch apart. The form was widely used in the twelfth century and later, and derives from a Saxon prototype. Our example is highly finished and need not be earlier than c. 1300 (Fig. 2, 1). Fragments of similar ware occurred at Nuthampstead. 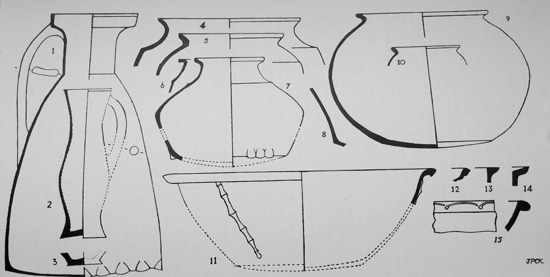 (2) Fragments of a jug. Found outside the moat opposite the gravel path. Very hard fine red ware, covered by a uniform dark mottled green glaze. (3) Fragment of a jug. Found on Heap 1. Hard pink fabric, uniform mottled green and white glaze. (4) Base of a cooking pot. Surface find. Hard pink fabric, thick treacly green glaze on inside of vessel. (5) Fragment of a jug, perhaps with incised decoration. Surface find. Hard white fabric, even metallic green glaze. Nos. 4 and 5 are without parallel among the bulk of finds and are probably strays. Their date is perhaps c. 1500. (6) Pitcher of baluster type, sandy buff ware, handle of circular section, concave base. Found about 62 feet from the W. end of B. None of the portions recovered, which include the base, handle, and much of the sides contained any trace of glazing. The interior has pronounced ribbing. A common type of the thirteenth - fourteenth centuries, but our specimen is a late example (Fig. 2,2). (7) Base of a flat-bottomed pitcher of hard pink fabric. Found on Heap 1. A common type of the thirteenth-fourteenth centuries (Fig. 2, 3). The coarse wares are local in character, and in the absence of published pottery from the area, strict parallels are lacking. In general the cooking pots are markedly globular in form, and the profiles of their bold out turned rims have more affinities with Roman and Saxon forms than with most contemporary medieval pottery of the S.E. of England, which generally has small rims of square section. Another purely local feature is the pronounced shoulder noticeable on a high proportion of the vessels. The relative dating of our pottery can only be determined by internal evidence, and I therefore propose to publish here those vessels and sherds mustrate the characteristic types found at this site, and which might be expected to appear at other places of a similar nature. Affinities can be found with the pottery from Scales Park, Nuthampstead, but sherds of a similar date from Brent Pelham are totally different in fabric. levels in some cases retain this feature (Fig. 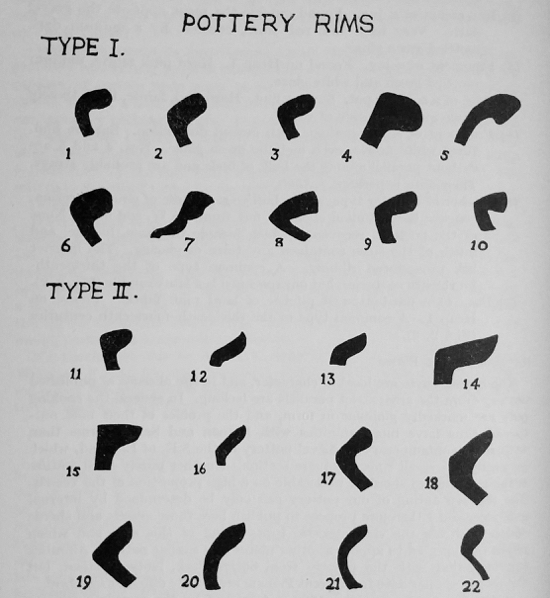 3, 13, 16), but in others the rim forms an angular junction with the body (Fig. 3, 17. 18: 2, 5). One from Heap 2 was of this variety (Fig. 3, 19), but the characteristic development of this type was a group in which rim and neck joined the body in a sharp carination (Fig. 3, 21, 20; 2, 4). More delicately moulded and ornamental in character is a small pot not corresponding to the other type (Fig. 3, 22; 2, 10). Fabrics are usually fairly hard and sandy, red to purple in colour. Beside them, however, occur others fired very much harder to a uniform blue or buff colour. There were rare examples of rim type II at Nuthampstead and Brent Pelham, but the majority of vessels from these sites had the flat-topped rims that normally characterized pottery of Southern England at this date. (8) Squat cooking pot with shoulder. A full quarter of the sagging base was found, showing that the group of three thumb-pressings cannot have occurred more than three times. Red-purple ware, rim type II (Fig. 3, 12). Maximum diameter 8.75 inches, height about 6.75 inches. Rim and base from the pit filling, side from the adjacent clean clay. Jugs with this squat profile were certainly in use in the early fourteenth century (Fig. 2, 7). Pottery of this fabric occurred quite commonly at Nuthampstead. (9) Globular cooking pot, undecorated, with sagging base. Red-purple ware, black exterior burnt red in parts. Rim type I (Fig. 3, 3). Maximum diameter 12 inches, height 8.75 inches. Base fragments indicate that the majority of the cooking pots were of this globular profile. Heap 1, embedded in clean clay (Fig. 2, 9). A similar vessel (rim type II), with stab and applied strip decoration, was found at Nuthampstead, vid. Antiq. Journ., xxvi (1946), p. 142, Fig. 5, 4). and need not be later than c. 1300. (11) Upper part of a cooking pot with pronounced shoulder. Very hard grey ware. Rim type II (Fig. 3, 18). Diameter of mouth 6.5 inches. From the upper levels of Heap 1 (Fig. 2, 5). (12) Upper part of a cooking pot with carinated shoulder. Very hard blue ware. Rim type I (Fig. 3, 10). From Heap 2, but a fragment of the shoulder of a similarly carinated vessel of hard grey fabric came from the edge of Heap 1 (Fig. 2, 6). shoulder. Pale red ware, of similar fabric to Nos. 8–10. Traces of soot on exterior. Rim type II (Fig. 3, 20). Diameter of mouth 8.75 inches. Heap 2 (Fig. 2, 4). (14) Lower part of a cooking pot. Unusual on this site for the markedly carinated juncture of base and body. Very hard light grey ware akin to the fabric of No. 12. Found on the edge of Heap 1 (Fig. 2,8). (15) Lower part of a cooking pot of globular form. Hard sandy buff ware. Heap 2. (16) Upper part of a small globular pot. Fine hard brown fabric. Bulbous rim (Fig. 3, 22). Maximum diameter 4.75 inches. Heap 2 (Fig. 2, 10). (17) Upper part of a large bowl, with vertical applied strip decorated by thumb impressions. Hard grey gritty fabric. Hammer head rim, probably a variant of type I (Fig. 3, 5). Maximum diameter 16 inches. From the edge of Heap 1. Apart from this piece, only two sherds have been found with applied strip decoration (Fig. 2, 11). (18) Rim of a bowl of hard blue fabric similar to that of No. 12. A more elaborate example of a well-known thirteenth century form. Rim type I (Fig. 3, 7). From the upper levels of Heap 1 (Fig. 2, 12). (19) Upper part of large bowl, rim decorated with lightly incised lines with globular ends. Hard rough grey ware. Rim type I (Fig. 3, 4). Maximum diameter 24 inches. From the upper levels of Heap 1 (Fig. 2. 15). (20) Upper parts of two bowls. Hard brown fabrics. Rims type II (Fig. 3, 14-15). From the upper levels of Heap 1 (Fig. 2. 13-14). (1) Iron knife with bone handle, usual type. Total length 8.5 inches. Blade of triangular section shows traces of gilding. Heap 1 Found corroded on to part of No. 2. (2) Iron shears, length 3.5 inches. London Museum Cat. Type II (thirteenth century and later). Heap 1. (3) Latch-lifter, length 4.75 inches. Cf. London Museum Medieval Cat., p. 148. Unstratified from trench E, perhaps from a gatehouse on the causeway. (4) Roof-batten nail, length 1.5 inches. Its bent end explains why it was found with the discarded tiles on Heap 1. For these nails cf. Sir H. Lambert, A History of Banstead in Surrey (1912), p. 129. I am indebted to A. W. G. Lowther, F.S.A., for this information. (5) Piece of the right-hand arm of a horseshoe. The plain outline and pronounced calkin indicate a late medieval date , and although unstratified, it may well be contemporary with the occupation of the site. Trench E.
Two separate layers of London Clay may be distinguished. The upper stratum, of yellow clay with white streaks and specks, extends from near the surface to a depth of about 11 feet. It was possible to remove the lowest spit of this cleanly to reveal the smooth flat surface of a layer brown clay with blue streaks. Small patches of wet gravel sometimes intervened between the two layers. The fossil remains, all of which derived from the upper layer, are therefore themselves geologically stratified, and it has consequently been thought desirable to include a list of the types found. A list has kindly been furnished by the Department of Geology of the Natural History Museum. (1) Gryphaea dilatata from the Oxford Clay. (2) Gryphaea arcuata from the Lower Lias. (3) Pecten aequivalvis from the Middle Lias. (4) Deshayesites from the Lower Greensand. (5) Indeterminable (impression of an ammonite, possibly Pavlovia from the Upper Kimmeridge Clay). (6) Fragment of belemnite, perhaps Pachyteuthis, derive Upper Jurassic per Glacial Drift. 1: J. Crawford, Esq., of Potterells Farm. 2: W. G. Green, Esq., of The Cottage, Dixons Hill. 3: The National Grid reference to the site is 227052. 4: A moat dug to a similar plan is Minsons, Willingale, Essex, though the widening of the side next to the entrance is less pronounced. I am indebted to Mrs. Williams for making available her unpublished plan of this site. 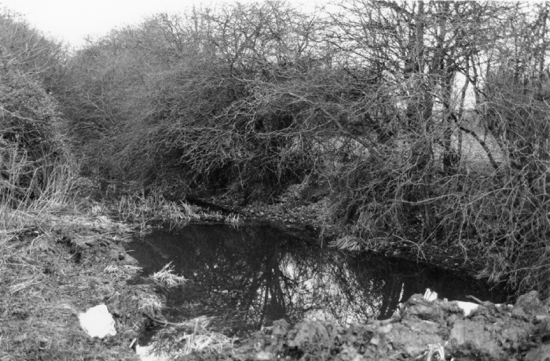 5: A clear local example of this type is Camlet Moat in Trent Park, Enfield. A similar phenomenon was noted at Pachenesham, near Leatherhead, Surrey, where the moat was much later than the earliest buildings on the site (P. Leatherhead and Dist. Local Hist. Soc., I. 1 (1947)). Upcast was thrown inside the moated area at the unfinished site at Scales Park, Nuthampstead (Antiq. Journ., xxvi (1946), p. 138 f.). 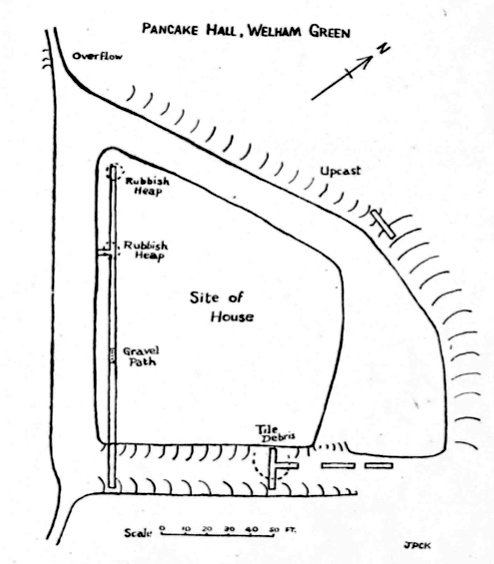 Hugh Braun (The English Castle (1936), p. 90) states that moats of U-shaped section are characteristic of the thirteenth century. 6: Cf. Place-names of Hertfordshire, pp. 66-7. 7: For the dating of horseshoes cf. London Museum Mediæval Catalogue, p. 112.